The ship came down from space. It came from the stars and the black velocities, and the shining movements, and the silent gulfs of space. It was a new ship; it had fire in its body and men in its metal cells, and it moved with a clean silence, fiery and warm. In it were seventeen men, including a captain. The crowd at the Ohio field had shouted and waved their hands up into the sunlight, and the rocket had bloomed out great flowers of heat and color and run away into space on the third voyage to Mars! It’s against the advice of most writing guides to begin an essay/review with a quotation (a block quotation in particular), but Ray Bradbury’s voice sells itself. I can think of no other writer who better communicates a sense of wonder and joy. Full disclosure: I put off reading The Martian Chronicles until I’d read all other Bradbury stories I could find. I worried it would be another one of those awful sci-fi books to take itself too seriously and rely on ridiculous inventions and technobabble to move the plot—that brand of sci-fi doesn’t age well. While the book is centered around voyages to Mars, the technology takes a backseat to the basic thrill of exploration. I should have had more faith in Bradbury and read it sooner. There are no convoluted descriptions of robot pilots, cryonic sleep-tanks, etc. ; the emphasis remains fixed on the joy of discovery. This is timeless. What further elevates this book and keeps it feeling [almost] contemporary is the way Bradbury consistently takes the extra step into originality. His Martians are telepathic, of course. It has become a staple to have at least one telepathic alien race per series, but Bradbury does not use telepathy for just communication and simple mind control. Two of my favorite stories in this collection feature telepathy and its potential consequences. I don’t want to spoil them here, but they’re incredibly clever. And terrifying. So often, the ‘original’ feels cliched if you read it after reading all the books that have come after and borrowed from it, but no one has replicated Bradbury’s cleverness. The Martian Chronicles remains relevant. The first third of the book deals with the attempts to land on Mars, the middle third with the colonization of Mars, and the last third with a nuclear war on Earth. Don’t pass on this book because it’s old and the cover art is occasionally silly. It is a miraculous book. After reading it, you’ll understand why Curiosity’s landing place on Mars is named Bradbury Landing. It isn’t just because NASA is [thankfully] staffed by nerds in search of literary references. It’s because Bradbury inspired an entire generation to wonder what was beyond our own blue marble. 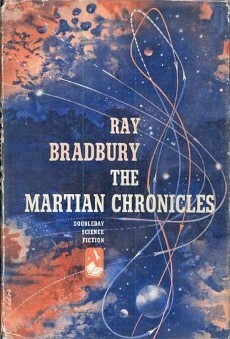 It’s difficult for me to write about Ray Bradbury and/or The Martian Chronicles. His death moved me more than I expected and I still get choked up to think of it. He made it 92 years and left behind hundreds of stories; it cannot be reasonably expected for him to have lived longer or written more, but I miss him. I have read too many books across too many genres to have a “favorite” book or author, but if pressed to choose, I would choose Bradbury. His books were the first to keep me up past my bedtime with a flashlight under the covers. His voice is simple, clean; his descriptions are so clear as to seem definitive. His stories are as wonderful to me now as when I first read them. Translation: I don’t think I need to elaborate after such a gushing review. I’m only including this field so this review matches my others in format.